Anyone who has ever spent a night out under the stars with kids will know the “Mac and Cheese Principle”: a pot of mac and cheese cooked outdoors after a day outside hiking, kayaking, biking, or rock climbing will taste exponentially better than the same pot of mac and cheese cooked inside on your kitchen stove. Whether it’s the fresh air, the exertion, the woodsmoke, or a magical combination of the three, this is a simple and beautiful truth. And just like the ”Mac and Cheese Principle,” if you hike up a hill and ski or ride down it, it can be immeasurably more enjoyable than a ski run from a chairlift. Maybe it’s the fresh air. Or the silence. Maybe the sweat, or the untracked powder you will find on the little-visited hills throughout New England. Or the satisfaction of “earning your turns.” Whatever it is, if you love the snow and the mountains, it’s a great way to get the kids outside for some winter fun. Kids will love the sense of adventure of backcountry skiing. Backcountry skiing has been popular in New England for centuries—in fact, before there were resorts and high speed lifts, all skiing was backcountry skiing. Skiers simply found a nice steep section of forest or mountainside, hiked up it, strapped on their wooden skis and skied down. But you don’t have to go to be an expert mountaineer or go to great lengths to enjoy this sport—even in the heart of some New England towns and cities you can find hidden ski runs in city parks and forests. And those who live in suburban and rural areas have countless hours of exploration ahead if they take the time to look in the hills and forests surrounding them. Backcountry skiing is best attempted by families who know how to ski or snowboard confidently. Depending on your kids’ abilities, they could start as young as 6 or 7. But they must be able to ski confidently, navigate around trees, rocks, and other obstacles, handle deep powder and stop on a dime. They must also have the stamina for the uphill portion! But usually the excitement of looking forward to the downhill will keep them pushing uphill. If the kids don’t have these abilities yet, keep practicing on nearby open slopes or find an affordable community ski area where you can teach your kids to ski for relatively little cost. Here are some tips to get you off on the right track with kids. Bring a picnic lunch to share at the top! During lunch, build a living room in the snow. Pack down a 10 foot circle, then carve in seating areas and counters along the edges. Place your skis or board on the benches to keep you dry. Build a snow fort or a campfire along the way. Snowshoes: Snowshoes are much more useful for backcountry skiing than XC skis. You can hike up the steeper slopes that make for better skiing, and just strap your skis or boards to your pack. The bigger the snowshoes are, the more flotation you get, but they’ll be harder to fit in your pack for the downhill portion. Grab some from an outdoor retailer, rent them, or check Craigslist or your local gear shop for used pairs. Downhill ski/snowboard gear: You will be hitting rocks, so if you have an older pair that you don’t mind beating up a little, bring them. Otherwise, be prepared to do some minor p-tex base repairs afterwards. Poles: You will absolutely need these in deep snow—going up and down. Even snowboarders should bring them to help navigate through deep snow and flat sections. Backpack: Big enough for your essentials and must be able to fit your snowshoes as well. External straps and anchor points are essential for strapping skis and boards to the sides. Lightweight shovel: Optional, but great for building lunch campsites or backcountry mini-jumps. Sun Protection: Sunscreen and shades or goggles are a must if you will be out in the open snowfields. The sun reflects off the snow and can burn skin and eyes. Insulation: Non-cotton, insulating layers. Fleece, poly-pro or wool are best in winter months. Illumination: Just going out for a morning ski? Still bring a headlamp. You don’t know what is going to happen out there. Hydration: At least 2 quarts of water per person. You will be thirsty after a climb. Shelter: A simple emergency blanket or tarp will do. Tools: I never leave home on a backcountry adventure without a lighter, Swiss Army knife or multi-tool, 50 feet of parachute cord, and duct tape. WIth these items along you can handle almost any situation. City and Town Parks: Just look for a hill! It’s that easy. The runs may be short, but you can do more of them. Burlington, Vt.; Portland, Maine; Dover, N.H.; and even Boston all boast hills popular with skiers and riders willing to hike for a few runs. Abandoned Ski Areas: Check out www.nelsap.org, a great collection of abandoned ski areas throughout the country. 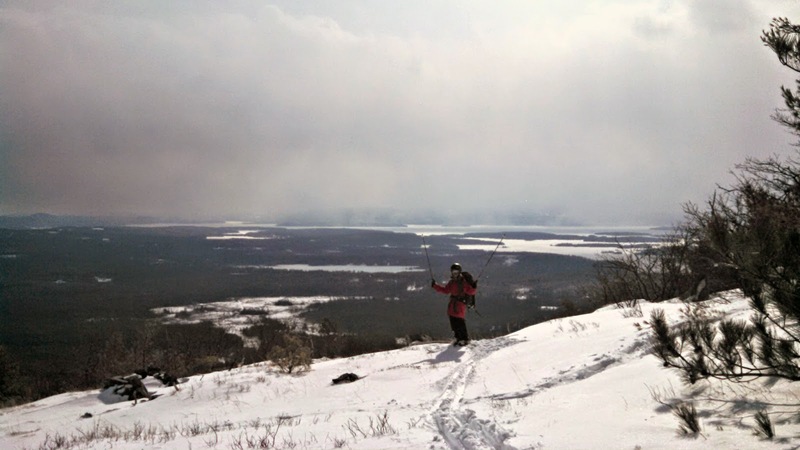 At many of these locations, the forest has not yet taken over the trails and there is great backcountry skiing to be had! Wide open trails and many of them. Just be sure to take note of properties that may be closed to the public. Best Backcountry Skiing In The Northeast, by David Goodman, published by AMC Books. A comprehensive guide to classic backcountry ski routes in New England and New York.